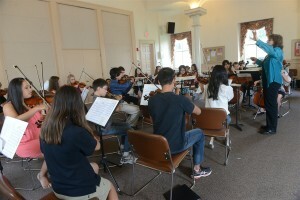 The Maryland Talent Education Center is a community music school in Maryland, offering violin, viola and cello lessons. This school for strings has locations in Mount Airy and Frederick. Our faculty are highly qualified and experienced teachers with extensive training in teaching and advanced degrees in music performance, who seek to help each student reach his or her highest potential in musical skill and artistry. Home of the ViolinPractice Method! Making practicing at home easier, fun and more effective. Guided practice videos and resources for students of all ages and levels. We are currently accepting beginning violin and cello students, ages 5-7. Students who already play violin, viola or cello should schedule a placement audition. Please contact us for more information by clicking on this link. Students at the Maryland Talent Education Center are part of a comprehensive program that includes private lessons, group classes, ensembles and frequent performance opportunities. We accept students ages 5 and up on violin, viola and cello. It is our goal to help students attain a level of skill and mastery on their instrument that will allow them to become lifelong players, no matter what their chosen profession. For students interested in pursuing a career in music, a personalized plan is created that includes a step by step strategy to help students achieve their dream of becoming a professional musician. Please visit our “Alumni” page to get to know some of our graduates. We appreciate your interest in MDTEC and invite you to consider fostering your child’s musical excellence through our program. See excerpts from a recent MDTEC recital below!